St. Andrew’s is a caring congregation welcoming you warmly with a handshake and a bulletin to help you get to know us and the worship service better. We want you to discover the joy that we share when we come together to worship God in spirit and in truth. St. Andrew’s Trenton is located at the corner of Marmora and Dundas Street in Trenton (16 Marmora street, Trenton, ON, K8V 2H5). Parking is limited but street parking is permissible on Sundays. For complete directions to the church location click here: (map and directions). Our morning worship begins at 10:30 am. The service usually begins with an instrumental prelude when you can prepare your heart for worship. Near the beginning of the service, you will be welcomed by our Pastor but not singled out in any way. If you desire you can fill out a communication card found in the pew and place it in the offering plate as it is sent around. During the service, you can follow our worship songs and hymns on the screen in front of the church. Near the beginning of worship the children are invited up front for a story after which they are dismissed for Sunday School. Please join us in the lower hall for a time of fellowship and refreshments. 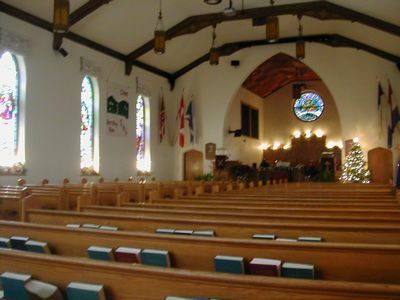 Once you’ve visited, we hope that you’ll choose St. Andrew’s Trenton to be your church home.